Changi Airport, which handled a record number of passengers, flights and cargo last year , will continue to leverage technology to handle even more traffic, while waiting for expansion projects such as the construction of Terminal 5 (T5) to be completed. Between January 2017 and last month, total passenger traffic grew by 6 per cent year on year to 62.2 million, Changi Airport Group (CAG) said yesterday. Aircraft movements during the period rose by 3.5 per cent to 373,200 landings and take-offs, while air cargo volumes grew by almost 8 per cent to 2.13 million tonnes. South-east Asia and North-east Asia accounted for about seven in 10 passengers Changi Airport handled during the year. Among the airport's top 10 country markets, India and China led the pack with double-digit growth of 16 per cent and 12 per cent respectively, while Kuala Lumpur replaced Jakarta as Changi's top city link. With a growing number of passengers travelling on multiple transport modes on their journeys, Changi is also taking steps to cater to this segment. Last year, a new shuttle service was launched to facilitate transfers between Changi Airport and Tanah Merah Ferry Terminal. This has seen a ridership of close to 10,000 passengers in its seven months of operation. To grow the fly-cruise market, CAG has also signed on to various collaborations with cruise companies - which are expected to bring in more than 600,000 visitors over a four-year period. Transfer and transit passengers continue to be an important segment for Changi Airport. Under the ongoing Changi Transit Programme, about 700,000 passengers claimed transit rewards while shopping in Changi last year. Changi's numbers last year are in line with global trends, based on preliminary data released by trade body Airports Council International (ACI) recently. Based on the January to October trend, ACI expects total global passenger traffic to increase by 6.5 per cent year on year. Speaking at a media briefing yesterday, CAG's managing director for air hub development Lim Ching Kiat said that 2017 was a significant year for Changi, with strong growth in both passenger and cargo traffic. "Looking ahead in 2018, we expect to see more developments in the long-haul segments to Europe," he said. This includes the launch of Scoot's non-stop service to Berlin, LOT Polish Airlines' new service connecting Singapore and Warsaw, and the return of Qantas' Singapore-London route. 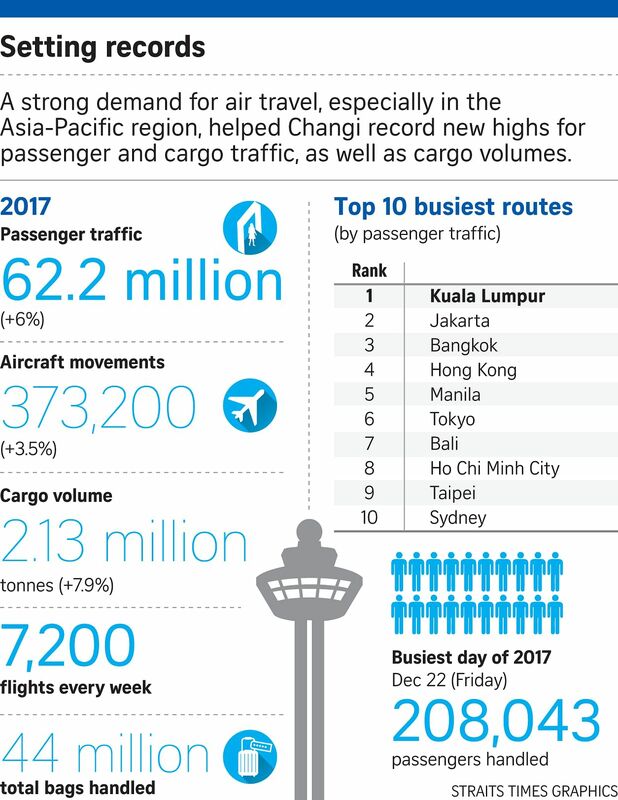 Centre for Aviation's Mr Brendan Sobie noted in a recent report that Changi was the busiest airport in South-east Asia last year, crossing the 60 million passenger mark on Dec 18. "The T5 project may seem very ambitious, but is realistic, in the context that Changi traffic will likely double again over the next 15 to 20 years," he said. With the demand for air travel in Asia-Pacific expected to triple in the next two decades, Changi is growing capacity to cater to the growth. Terminal 1 is being upgraded alongside the development of Jewel Changi Airport - a mainly retail hub which will open in early 2019. This will increase Changi Airport's handling capacity to 85 million passengers a year. In the longer term, T5 - which will eventually be able to handle up to 70 million passengers annually - is slated for completion around 2030.